Seconds before my exam i was ready, focused, determined, then my phone went. Exam finished and forget any other plans I initially had, off to Flat Iron. Fred Smith, for those of you who don't know, was the head chef at The Admiral Codrington. 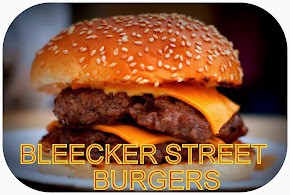 His kitchen became universally regarded as one of the best burgers London, in fact anywhere, had to offer. 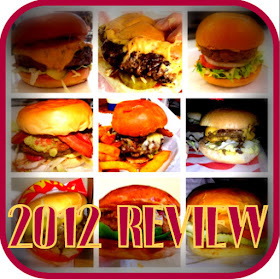 During his time there I had 2 cheeseburgers and the double stack special - the first cheeseburger wasn't reviewed but was one of the main reasons I started this blog last March. The beef, cheese and the general construction of the burger, really was superb. 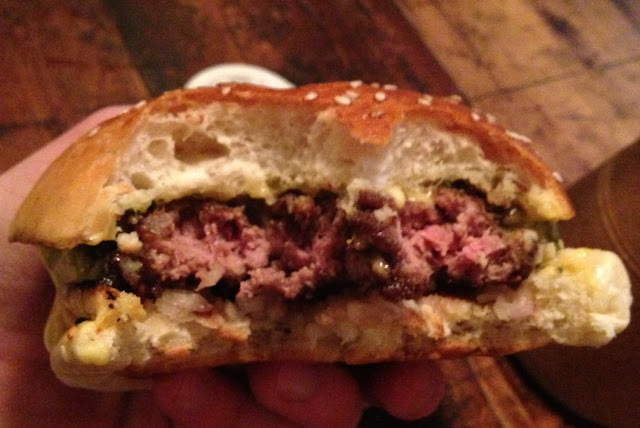 So in short, when Fred Smith launches a burger, you go. The unique selling point of the béarnaise burger is the patty - it's deep fried in beef fat. I've seen pictures and reviews of fried patties but sadly until this I hadn't had the chance to sample one. Bright! Really does show the patty however. Burger arrives and immediately you're hit with that fried smell, similar to that of a KFC burger. The patty sits on a bed of diced shallots and covered on top with the béarnaise sauce. Instantly on first bite you get the incredible crust of the patty hits you like nothing I'd tasted before it. This wouldn't have been possible cooked on the grill as it would have cremated the inside, whereas here you still have a juicy pink middle. The flavour isn't spectacular but it's more about the patties texture and for that it's unrivalled. The béarnaise sauce really is something special, it has a buttery soft flavour that oozes into the crevices of the fried patty and give you a wonderful contract in textures. The quality of the sesame seeded bun is obvious. It's a dense yet light with a well toasted crunch and a slight sweet taste that fits with the buttery sauce and crisp patty like they are made for each other. I wouldn't recommend the dripping cooked chips at £2.50. Despite having a huge crunch on the outside unfortunately it was a bit empty inside and lacked any of the fluffy potato needed. The Bethnal Pale Ale's subtle bitterness really complimented the burgers flavours, especially the sauce. It doesn't compare to the burgers I had from Fred at The Admiral Codrington but it was still a very very good burger and a fried patty is something that I've not seen anyone else doing in London. For the next 2 weeks Fred has around 100 deep fried burgers each week - and with a parmesan cheese special next week, you know where I'll be...Go. I love that gourmet burgers have become so popular... a trend, I believe was started by Wetherspoons!! I say we all get together, make a massive group of burger lovers, and plan a new burger expedition each month.